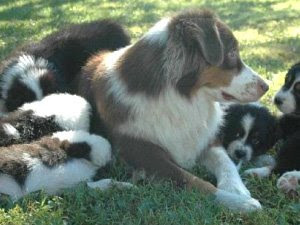 Color(s): blue merle, black, red merle, or red, all with or without white markings and/or tan points Coat: The Australian Shepherd has a striking and varied coat. It is of moderate length, straight to wavy, and weather resistant. The coat comes in four accepted colors: black, blue merle, red, and red merle. A variety of white and tan markings may appear on the face, chest, front, and rear legs. Distinct feature: The Australian Shepherds most identifiable characteristic is the natural or docked bobtail. Their eyes are one of this breeds most commented on feature. Their eyes come in a variety of colors or color combinations and include blue, amber, hazel, and all shades of brown. The Aussie is a vigorous and athletic breed. Temperament: Australian Shepherds are intelligent, delightful, and loyal. They are highly energetic and thrive on being given something to do. The Aussie has a high degree of intensity and a "no-quit" attitude. Their herding instinct may be problematic or annoying to their family, as this breed will often attempt to perform this task on everyone or anything that moves. They are reserved and cautious with strangers until the Aussie decides about them. They are confident and protective. Human companionship is crucial to this breed. They get along well with active, considerate older children. The Aussie is not typically aggressive to other dogs. Activity: The Australian Shepherd requires an inordinate amount of exercise. A mere walk is not sufficient. They thrive on running, herding, playing, and all family activities. They are at their best when they are given a great deal of social interaction and a task to do. Australian Shepherds are not recommended for apartment dwelling.